The popularity of Christmas log cake recipes has exploded since the original one. Occasionally I come across writings that claim this cake has been around since ancient times. I have seen no proof that it has been around any earlier than the nineteenth century. The original Buche de Noel or Yule log cake is French. It seems that the first was made with sponge cake and ganache. NOTE: For this Christmas log cake recipe I used the chocolate cake recipe, the peanut butter filling recipe and I doubled the recipe for chocolate glaze recipe #1. I only came across and learned how to make these Christmas log cake recipes in the latter half of my life. The Buche de Noel or Christmas Yule log cakes which I tasted were all very good. I also love how they can be decorated to make pretty presentations for the holiday season. Traditionally the filled cake is rolled up “jelly roll” style. The traditional one also has one end cut off and affixed to the main log. This is done to resemble a cut off branch but many bakers choose to make it a “straight log”. For the finishing touch tines of a fork are dragged along the outside frosting making it to resemble bark on a tree. Since the origination of the French Buche de Noel, these cakes have become a favorite around the world. Many Americans have learned how to make Christmas log cakes in all kinds of flavors and designs. 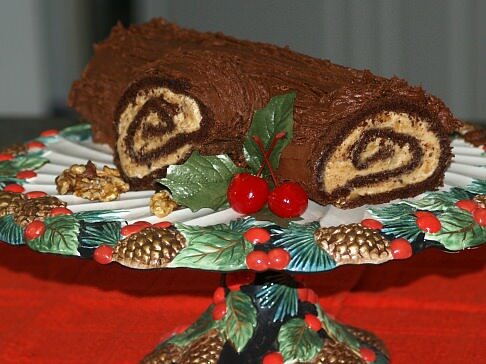 These rolled “log” cakes have even become favorite cakes outside of Christmas due to the great taste. It is simple to change the decorating from Christmas to any special occasion. The key “step” in learning how to make Christmas log cake recipes is the handling after baking. Immediately after removing the cake from the oven, it is turned out onto a clean dish towel. Some recipes instruct you to dampen the towel or dust it with powdered sugar. It is important to follow your recipe’s instructions. As soon as the cake is placed on the towel, it is rolled up “jelly roll” style and let to cool. After the cake cools, then you can add the filling, frosting and decorations. If you are learning how to make Christmas log cake recipes I am giving you two basic cake recipes to use. Below is a recipe for CHOCOLATE SPONGE CAKE and a YELLOW SPONGE CAKE. I am also giving you recipes to choose from for suggested fillings. TIP: For presentation of Christmas log cake recipes, choose filling to contrast color of cake making cake look like inside of actual real log. NOTE: These Christmas log cake recipes (Almost always) MUST be placed in the refrigerator or freezer after filling them. Learn how to make Christmas log cake recipes with this yellow sponge cake recipe. Lightly grease 15X10X1 inch jelly roil pan; line with parchment paper and grease again. Beat yolks and vanilla on high speed for 5 minutes until thick and lemon colored. Gradually beat into yolk mixture 1/3 cup of sugar until dissolved; WASH BEATERS and dry. Beat egg whites on medium speed until soft peaks form; gradually add in the ½ cup of sugar. INCREASE mixer to high speed; beat until stiff peaks form. Fold yolks into egg whites; sprinkle flour mixture 1/3 at a time over the egg mixture folding in lightly. Bake 12 to 15 minutes until done. Immediately loosen around edges of pan; turn out onto a clean towel dusted with powdered sugar. At short end roll up cake and towel like a jelly roll; place on rack to cool. 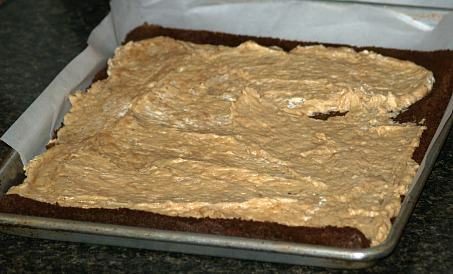 Unroll cooled cake; spread filling over cake leaving ½ inch clear around cake. Reroll cake without the towel. Cut 1 inch slice from one end of cake roll; place cut piece on top center of roll. Frost roll EXCEPT for the cut side of the small piece. Use a knife or fork to draw lines through the frosting making the appearance of bark; chill. Learn how to make Christmas log cake recipes with this chocolate sponge cake recipe. Preheat oven to 375F degrees; grease pan 10 ½ X 15 ½ X 1 inches, line with parchment paper and grease paper. In another bowl combine flour, cocoa powder, 1/3 cup sugar, soda and salt. Add flour mixture alternating with water and vanilla to the egg mixture on low speed until smooth. WITH CLEAN BEATERS, beat egg whites until foamy; gradually add 1 tablespoon sugar and beat until stiff peaks form. Carefully fold beaten egg whites into batter; spread batter evenly in prepared pan. Bake cake for 15 to 18 minutes until top springs back lightly touched. 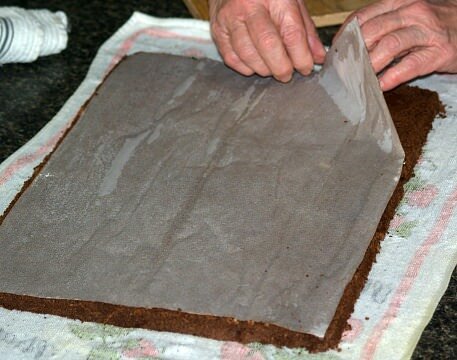 Invert cake onto slightly dampened clean kitchen towel; remove parchment paper. 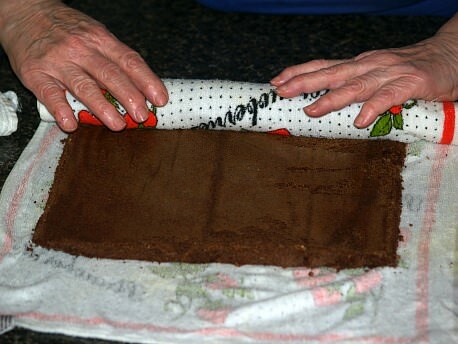 Immediately roll cake and towel up “jelly roll” style beginning at the narrow end; let stand 1-2 minutes. UNROLL cake and towel; remove towel and reroll cake and cool completely. NOTE: When I reroll this cake, I place a piece of WAX paper on top covering the cake before rolling to keep it from sticking. Wax paper is thinner and works better than parchment. Unroll cooled cake and spread with choice of filling; reroll. Garnish: chill 1 hour before serving; serves about 10. IN TOP of double boiler over simmering water place chips, milk and marshmallows. Stir until marshmallows and chips are melted; cool to lukewarm. Whip heavy cream until stiff; fold in vanilla and peanut butter mixture. Beat whipping cream, sugar, cocoa powder and coffee mixture until stiff peaks form. Unroll cooled cake and spread with filling; reroll cake and frost. COMBINE AND BEAT together cream and sugar until stiff peaks form; blend in vanilla and brandy. Fold in walnuts and candied cherries; unroll cake, spread on filling and reroll. 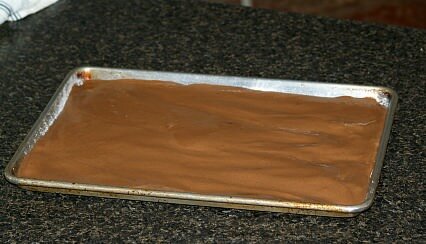 MELT CANDY with cream in a heavy saucepan over medium low heat stirring constantly until smooth. Remove from heat and stir in rum; cool to room temperature. When cool fold in whipped topping; unroll cake, spread filling and reroll. NOTE: Place in freezer while making frosting. DRAIN CHERRIES reserving ½ cup of syrup; RESERVE 4-5 cherries if needed for garnish. Chop remaining cherries in quarters; set aside. Combine ½ cup of syrup, cornstarch and syrup in small saucepan; blend until smooth. Cook and stir mixture over low heat until thickened and begins to boil; add chopped cherries. Cook cherry mixture 2 minutes longer; set off heat and allow to cool. Combine jam and kirsch; blend well. Unroll cake and spread with jam mixture; spread cooked mixture over the top and reroll cake. SUGGESTED TOPPING is whipped topping with cherry garnish. COMBINE AND BEAT together cream cheese, butter and vanilla. Add sugar and beat until well blended; stir in nuts if desired. Unroll cake and spread filling; reroll cake. It takes only half of this recipe to fill Christmas log cake recipes. Make half of the recipe OR use it to frost the roll. COMBINE IN BOWL lemon juice, milk, and food coloring; blend well. Fold in whipped topping and coconut; unroll cake, spread filling and reroll. COMBINE AND BEAT cream cheese, sugar, almond and salt until creamy; blend in peaches. Beat whipping cream in separate bowl until stiff; fold into peach mixture. 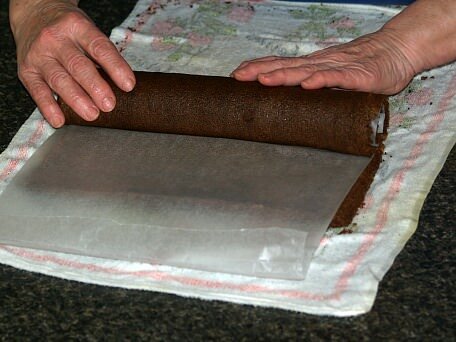 Unroll cake and spread with filling; reroll and frost cake roll. MELT BUTTER in small saucepan over low heat; add cocoa powder and water. Stir mixture in saucepan constantly until mixture thickens; DO NOT BOIL. Remove from heat and cool slightly; blend in sugar and vanilla. NOTE: This thickens as it cools so if you want it thicker to spread let it cool. COMBINE IN TOP of double boiler over hot water the chocolate and shortening. Stir until melted and smooth; stir in corn syrup; cool slightly. COMBINE butter, cocoa powder and sugar in bowl; add milk and beat until spreading consistency. After frosting cake log, run fork tines over to look like bark; sprinkle with pecans. BEAT CREAM until soft peaks; add sugar and beat until stiff. COMBINE in small saucepan sugar, brown sugar, water and corn syrup; cook to 236F degrees on thermometer. Meanwhile beat egg white and cream of tartar on high speed in small bowl to soft mound. Gradually pour hot syrup over egg white beating constantly until thick enough to spread.